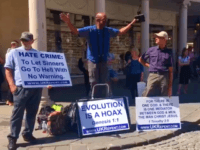 UK police have dispersed a group of Christian preachers from a public space, describing their actions as an “incident of public disorder” after members of the public heckled and called their views “provocative”. A Florida homeless man bathing himself in a pond Monday was in for an unpleasant surprise when an alligator started biting at his toes, authorities said. A San Diego woman saw a common fear come to life on Thursday when she was getting ready to take a bath and a foot-long snake appeared in the drain of her tub. Quart’e Sapp, a highly recruited high-school linebacker, just gave “taking a bath” a whole new meaning.